Experts don’t recommend sleeping on your stomach. But if you do, they recommend using a belly pillow. This is a pillow that fits under your belly and prevents your spine from sinking into the bed. The result is less pain in the morning. Belly pillows also provide spinal support for pregnant women. The belly gets very heavy during pregnancy, interfering with sleep. A belly pillow can help with that. But you may wonder how to go about finding a good belly pillow that is actually comfortable. You need something that lets you actually sleep and that doesn’t press into your belly. As a pregnant stomach sleeper, I have gone on a mission to find belly pillows that actually work, and here are the results of my search. Read on to find the best belly pillow for your unique sleep needs! 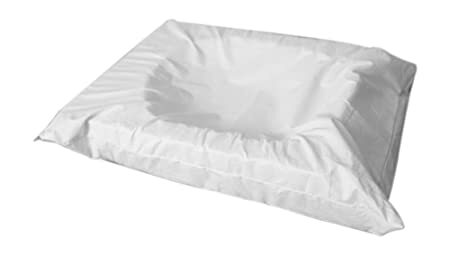 Overview: This compact satin pillow doesn’t take up all of the space that conventional pregnancy pillows do. It has three parts to maximize comfort where you need it the most. It is an adjustable pillow that allows you to find your perfect loft. It is hypoallergenic and 100% machine washable. Review: This pillow provided support to all angles of my body when I slept on my tummy. It is a great belly pillow because it is soft and adjustable so you can make it the way you need it. The design is attractive and there are no slip covers to deal with. I found that it was easy to care for because I could just throw it in the wash. However, the Velcro that attaches the three folding pieces really frustrated me. It tended to collect lint and washing didn’t clean it. The pieces also felt a bit flimsy. Overview: Made of dense memory foam, this pillow is flat on the bottom and rounded on the top. It is designed for supporting your lumbar spine (lower back) in stomach or back sleeping positions. It can also be used in a chair to support your spine as it curves away from the chair back. It is guaranteed to never go flat. Review: This pillow can be used in a bed or chair. It offered me tremendous support under my belly and I didn’t wake up with any back or neck pain. My posture has improved exponentially since using it. I also like to put it in my car for long car rides – no back pain is the result! It is a bit bulky and I only like to sleep with it on nights when my back is really bugging me. It can shift a bit while sleeping. You have to spot clean it and it has no cover. Overview: A perfect white wedge of Certipur foam, this pillow is designed to ease the burden on pregnant women or people with back problems. It trains you to sleep on your left side, which is proven to alleviate problems with pregnancy. The zippered cover is washable and the zipper faces away from the belly. It also comes with a free travel bag. Review: I loved how this pillow cradled my body and helped me sleep on my left side as opposed to my belly. It helped me train myself to not sleep on my belly. 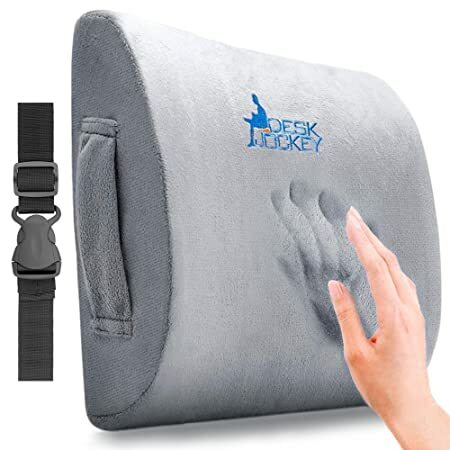 It provided significant back and neck support without distracting me while I slept. It was a little warm but not too bad. I found the white was hard to keep clean, but at least the cover is removable and washable. The zipper faces away from the body so I had no discomfort from it. 4. 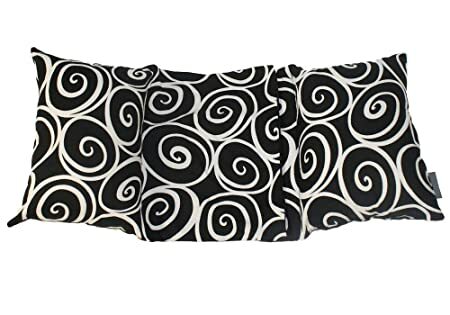 Hiccapop Pregnancy Pillow Wedge – Editor’s Choice! Overview: This pillow has two sides, one soft and one firm. The soft side is made of soft memory foam and the firm side is firmer memory foam. The lush Velboa cover feels soft against the skin and is easy to wash. The Certipur-certified foam has air vent technology to keep you cool. This pillow is meant to eliminate edema and back pain. Review: This pillow feels like quality, it is so soft. I appreciated that it had two edges to support my different needs. It is also comfortable if you use it under your knees. I had no swelling and slept more on my side with it. I woke up with no pain. After two months of use, the soft side was pretty much flat and useless. I appreciated that it stayed cool all summer. Honestly, it almost felt like it wasn’t there, which was great. 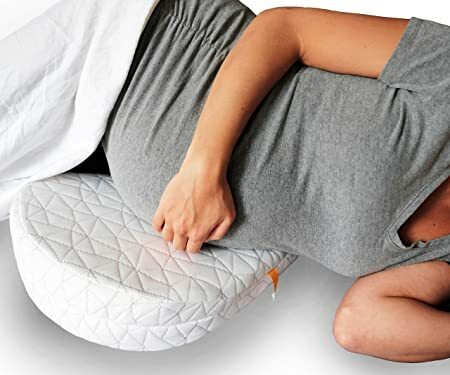 Overview: A square pillow with an indentation in the middle for your belly, this pillow allows you to safely and comfortably sleep on your belly, even after breast surgery, breastfeeding, or while pregnant. It elevates the hips and lower back for less pain and reduced swelling. Made with foam and a washable cotton cover, it fits in a carrying case and is USA made. Review: This pillow actually let me sleep the way I like – on my stomach! It alleviated all of the pressure and made me feel comfortable. I woke up with zero pain. You can tell it’s designed by a chiropractor. It took up little space on my bed and was easy to carry in the included case. However, in just a month, it was going flat. 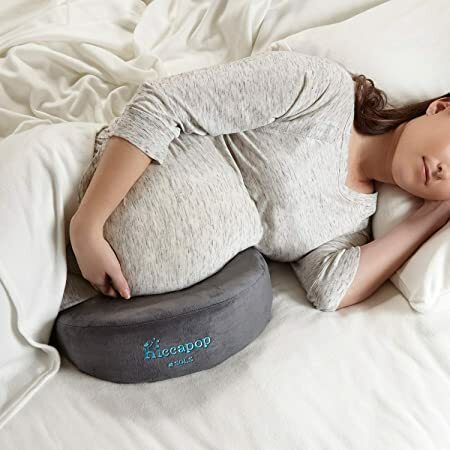 If you are a stomach sleeper or pregnant, you will benefit from a quality belly pillow. These pillows protect your spine and neck from pain and alleviate pressure on your belly. They can also train you to sleep more on your side than your stomach. Get on Amazon to find your best belly pillow today!